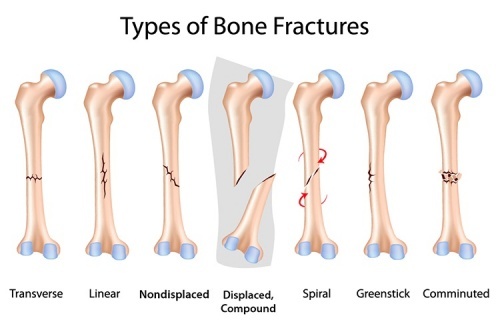 Bone fracture without skin injuries (wounds) is called a closed fracture. 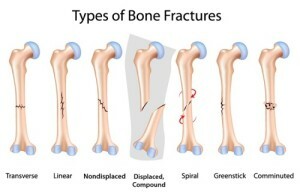 If at the point of fracture there is a wound, it is open or an external fracture. Bone fragments may damage blood vessels, nerves and muscles, or penetrate the skin by their sharp edges. In closed fractures, plaster splint is installed, and open fractures are usually repaired surgically. The goal and the purpose of modern treatment of fractures is not only to heal at bone level, but also to establish the full function of the part of the locomotor system that has been damaged. If the treatment is implanted with plaster splint, it is recommended to start exercising with the non-injured part in order to improve circulation and to prevent further complications. It is also very important to be educated how to walk appropriately on sticks (in case of leg fracture). Once plaster splints are removed, the goal of physical therapy is to improve healing and enable a person to restore the condition before the fracture as soon as possible. When an operations needs to be made, physical therapy is conducted in the hospital immediately after the operations. First exercises that are recommended are those for maintaining the flexibility of joints and to prevent the deterioration of muscle cells. After discharge from hospital, intensive therapy is to be continued in order to restore the person to every day activities. Magnet therapy is an effective method used for improving and accelerating healing of bones (helps in faster creation of calus). If pain is present, TENS may be used. Due to immobilisation, muscle atrophy may occur, so therapy uses electro-stimulation of muscles in order to prevent atrophy and to improve muscle mass. Electrical stimulation also replaces exercises for strengthening muscles which a patient is not able to do due to injury.